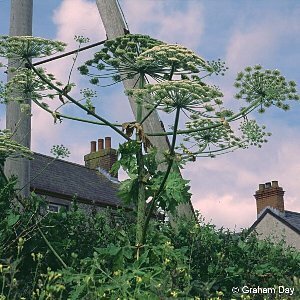 A spectacular giant species of hogweed, like its smaller cousin the common hogweed but bigger in all respects, growing up to about 12 feet in height. An alien species, introduced into parks and demesnes in the 19th Century as an ornamental, but now 'escaped' into the wild and spreading along most major rivers in Northern Ireland eg Lagan, Roe, Upper and Lower Bann, Ballinderry River etc. 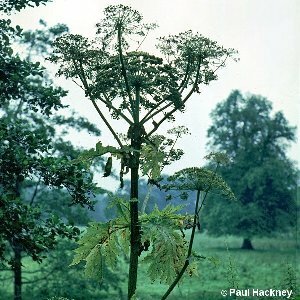 The sap is notorious for causing skin blisters in sunny weather, but this is also a feature of common hogweed sap.